Let’s be honest, no one likes doing their dishes. Even less so when they are at work. 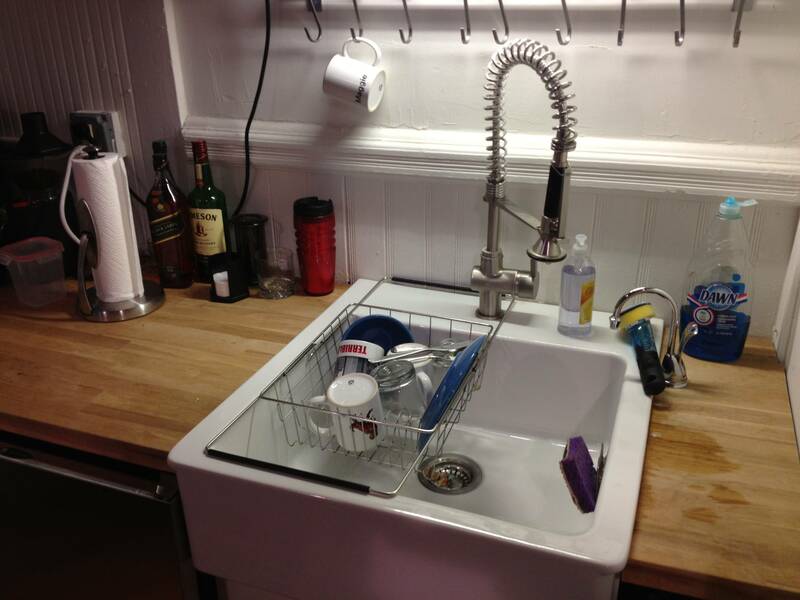 At Terrible Labs we have a small kitchen with a wash basin sized sink, no dishwasher but a very nice drying rack. The drying rack usually rests on a plastic mat which catches any water from recently cleaned dishes and deposits it back into the sink so that the counter doesn’t end up soaked. When the drying rack rested on the counter to the side sink, it created as much working space in the sink as possible. As with any busy person at work, it’s easy to place one’s dishes in the sink and quickly move on to the next thing. But each dish adds up which then leads to a full sink of dirty dishes. In an effort to relieve this problem, Joe decided to alter the makeup of the sink area to see if it would be possible to change the behavior of how people interacted with the sink space. Rather than keep the drying rack to the side of the sink, he suspended the rack over the sink to leave only half of it available.